A tool nobody should need, but everybody wants to have. 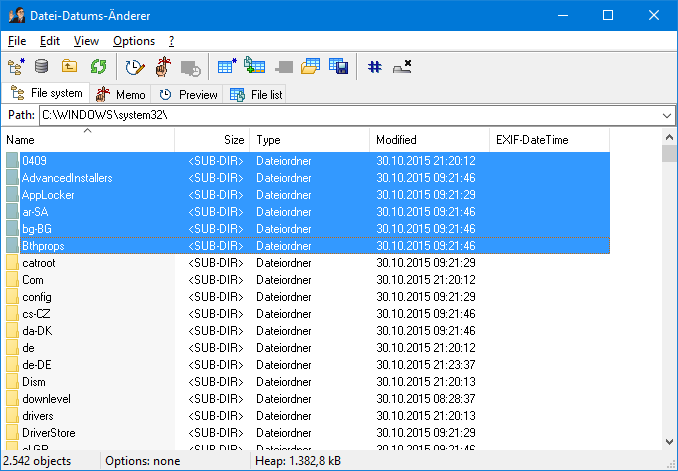 With the Datei-Datums-Änderer you can change the filedate of any file you want. And you don't have to pay for it because it is FREE! Just open a file, change the date, and save the changings. That's it. Furthermore the Datei-Datums-Änderer 1.1 is able to "remember" the filedates of a couple of files, so you can save them back all at once. It's fantastic! From version 1.2 on, you can even save a new date and time to a couple of files at once. If you want to, the time stamp is incremented file-by-file. Version 1.3 even allows negative values, as well as increasing/decreasing the original time stamp of multiple files. Using Version 1.4, you are able to edit a directory's time stamp or the whole contents of a directory (recursively). Keyboard shortcuts provide you with quick access to all functions. Wonderful! Version 1.5 introduces an English user interface as well as full timestamp support (created, modified, access) and EXIF support. Save your favourite settings for easy restore at next startup. Version 1.6 adds support for Windows 7 as well as some small improvements (see history). Version 1.7 shows a progress window, and you can cancel and undo operations. There is CSV file import and export, and a copy function for copying dates from one directory to another (recursively). All downloads have full source code. write-protected files. The info-window is of light blue. removed. You can tell the DDA how to handle these files. and save all the dates back by just a click. new file, so you can easily sort them by date then. At startup, the input fields now contain actual date and time. DDA functions. The user interface now has the Windows XP look-and-feel. (e.g. by using the "Open with..." menu). copy the timestamps from EXIF to the filesystem or vice versa. may store different settings for your common tasks. cleaned up and documented (doxygen). set directory dates according to the latest file contained within. difference between the actual value and the desired one. respecting daylight saving time on NTFS formatted volumes). text if the language was set to "system default" - this has been fixed. 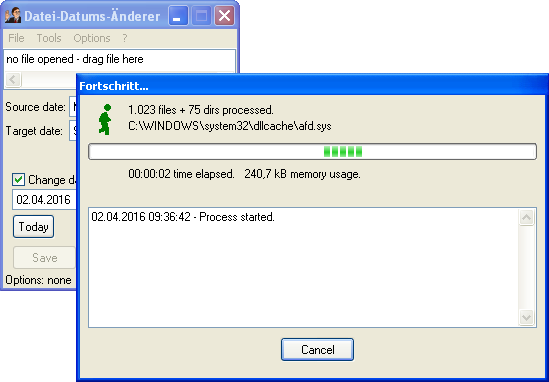 09-Apr-2015, and to GIGA.de download archive on 10-Mar-2016. already processed files (and directories) and the current memory usage. reset the edited dates to the state before your edit. 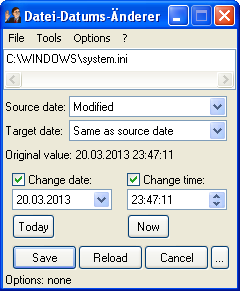 reconstruct the creation date after copying files, for example. you can easily edit data with external programs. date for directories now only operates on directories (and not files anymore). completely (there was a memory leak before). DDA.exe has been built by the free "Borland Delphi 6 Personal Edition"
Importing/exporting dates as CSV files is planned. In DDA 2.0, the main window shall become more understandable and intuitive. You may add files to a file list and process the files in desired order. the source and target date. for files using custom criteria may become possible. functions before actually applying the desired changes. The following table gives an overview of similar software tools and their features.